FastOut CS foam is the ONLY foam spot treatment you will ever need! 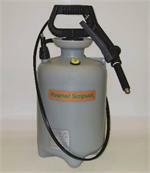 Fast Out Foam effectively "extinguishes" OVER 34 pests, AND can even be used in commercial food handling areas! Easy Foam Delivery Makes your pest Treatments Quick and Hassle-Free! 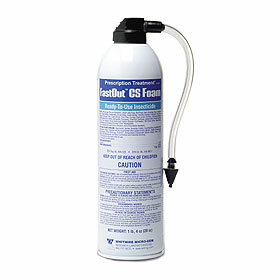 Fast Out CS Foam is an effective, dry foam solution in a 20 oz. 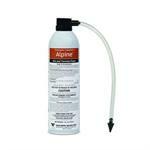 can from the leader in aerosol technology. FastOut Foam offers quick, hassle-free delivery of SmartCap microcapsules into voids and a hose and delivery tip that will exceed ALL your application desires! FastOut CS addresses termite swarms, difficult ant problems and other isolated insect infestations -- ON THE SPOT! I have a wasp nest inside my outer wall. The wasps are getting in where the upper vinyl siding meets the lower brick. I hung 3 bag traps that catch 10-20/day each but not enough to make a real difference. I tried wasp "foaming" spray, but they just disperse as soon as you spray, then fly back to the crack. I even sprayed it into the cracks and it didn't do anything. It doesn't really foam up like you expect, and it dissolves instantly. I read that wasps do not like the scent of dryer sheets and will abandon the nest - wrong! I stuffed them in the crack and they did exit at first, but soon came back. I also took rat glue traps(glue is nice and thick so they sink into it), taped them back to back to the end of a pole, leaned it against the main entrance and within 5 minutes each was covered in 40 wasps. That does seem to be pretty fast and effective, but still doesn't eliminate them. So after all these attempts I came across this CS Foam and thought I'd try it. I zip tied a metal rod to the plastic tubing so I could jam it 3-4 inches under the siding. It foams up like crazy. Similar to insulation foam, but not as dense and thick. More like a light shaving cream foam. The foam lasts several hours. I stuck it into 3 mortar joints and sprayed 4-5 seconds until it spewed out. The 1st time was later in the evening and most had already returned to the nest, so it didn't do much as by morning when they venture out the foam was gone, although the bag traps had much fewer wasps. The next day I did it earlier when they were still active and soon there were a lot buzzing around trying to get in the cracks. Some landed on the foam and got stuck. I used my rat glue board trap on a pole and left it at the main entrance for an hour thinking they will land on it trying to get in. When I came back it had 50 wasps plus a queen. Not sure if it is THE queen or a young queen. Either way I was happily surprised. I'll see tonite if there are more, but I doubt it, as I captured a queen. There is no nasty smell. It doesn't kill them instantly. The only thing is it would be nice if the foam had an attractant that lured them to land on the foam which makes them stuck, otherwise it works great. The applicator nozzle is too short when using from inside on outside walls that have a vapor barrier. The foam just fills between the backside of the inside wall and vapor barrier. I had to buy 1/8" ID PFE tubing, jam it on over the slightly larger plastic tip on the nozzle and use it as an extender... but not until after wasting one can. The extender still fell off once in a while, making a mess, not to mention the larger hole needed for the extender. It might be a good product if you could get into the necessary area effectively.